This article was originally published by The Daily Star (Bangladesh). All views are the author’s own and not attributable to SHLC. I went to Rwanda as part of the Sustainable Healthy and Learning City (SHLC) project, a consortium, to conduct research and explore global challenges to create sustainable and healthy cities in developing countries. When I was travelling to Rwanda, I was expecting to meet with many uncertainties and challenges given that it’s a country still struggling to recover from the wounds of war and genocide. But when I arrived, I was astonished to see how clean and green Rwanda’s capital Kigali is. People there follow traffic rules and diligently obey traffic signs. While visiting some neighbourhoods, I saw well-planned residential areas that adhered to urban design guidelines. Among many pleasant surprises, I was especially happy to discover “Umuganda”, an outstanding community initiative that I believe can set an example for the whole world. I was accompanied by more than 32 leading academics from seven participating countries including the United Kingdom, Philippines, India, China, Tanzania, South Africa, and Bangladesh. All the participants agreed that what Rwanda was doing through “Umuganda” could be emulated by the rest of the world. 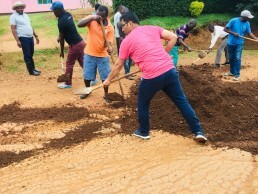 Dr Ramjee Bhandari taking part in Umuganda. Kigali, Rwanda. Credit: Gail Wilson, University of Glasgow. Umuganda is a simple yet powerful idea; it’s a collaboration between members of a community with an aim to contribute to the development of the neighbourhood. They come together every last Saturday of the month. The community combines their efforts to clean roads, build infrastructure, mend roads, and more. They even close their shops and stop doing other activities for at least three hours (starting from 7am) so that they can devote time when working with other members of the community. We realised the seriousness and commitment of the government when we were stopped several times on our way to a community activity that we participated in. The police stopped us three times and were not convinced until we showed them proof that we had special permission from the city mayor. We were once again pleasantly surprised when we arrived in a neighbourhood and became a part of their community work. That day, people gathered to repair a road that was heavily damaged by recent rain. Tracks brought soil from a nearby site to make the road usable for vehicles. The soil brought was volunteered by a neighbour who had a construction site which he dug and had the soil left over as a result. We were welcomed by the community and had a chance to work with them. During the community work, locals shared their stories of success of joint collaboration in many similar activities. They were happy that they were able to raise funds, however small, and no more relied on government funds. "Africa gave me hope. If Rwanda can do this, why can't we?" When we joined the post-work meeting along with the community, they explained that “Umuganda” meant “coming together with a common purpose to achieve an outcome.” It became official in 1974 although the practice began right after the independence of the country in 1962. The initiative in its current extent and form has been there since 1998 as part of an effort to rebuild the country after the ravage that followed the genocide of the Tutsi in the 90s. Although initially the government struggled to make this activity popular, it was gradually accepted and welcomed when people saw the results that Umuganda could bring. Because of its success in controlling erosion and building primary schools, administrative offices and health centres, the initiative began getting attention and praise. The success encouraged voluntary participation of the people and community leaders. The activity is managed by selected committees which are responsible for organising, supervising, evaluating and reporting the work done and, more importantly, motivating people. Statistics reveal that Umuganda’s contribution to the country’s development since 2007 is estimated at more than USD 60 million. The results are visible all around the country, especially in Kigali, the capital city. We visited a different neighbourhood as part of the project and noticed that the cities are very clean and found very little garbage on the streets. When talking to people, we were convinced that they took pride to be a part of this community-driven initiative. The self-dependency of the community was clearly recognised in the monetary participation of the community which ensured that neighbourhood watch and a system of solid waste collection could be provided. The success of Umuganda is rooted in the commitment of the community—something that can easily be emulated in Bangladesh. Our culture and tradition of community bonding in rural areas especially can be utilised effectively in development programmes through activities such as Umuganda. As a result, labour costs and the amount of money being diverted to corruption would go down since the initiative would be participated in and financed by direct beneficiaries. In the face of rapid urbanisation and limited tax recovery by the government, people’s pro-active involvement in community work may highly benefit our country by creating better and sustainable neighbourhoods in cities and villages. This would give the community a sense of ownership and belonging. Be it traffic management, keeping our cities clean, or preventing the loss of greenery in neighbourhoods, community action can be very effective in resolving many issues. Africa gave me hope. If Rwanda can do this, why can’t we? We have more people in our cities, we have strong community bonding, and we have achieved significant progress over the last few decades. With initiatives like Umuganda, we will be able to play our part in community development and be proud of ourselves. This research report reviews and analyses Tanzania’s planning and urban development policy documents for the last twenty years, identifying the key ideas and policies that have shaped the delivery of public services, paying particular attention to education and healthcare. This report also presents city profiles for two of Tanzania’s cities: Dar es Salaam and Ifakara. This report is written by the Ifakara Health Institute. The percentage of urbanisation in Tanzania has increased six-fold since the 1960s, rising from 5% to 33% in 2017 . Forecasts suggest this growth will continue. By 2045 there will be more urban residents compared to rural, with the urban population reaching 55.4% in 2050. In comparison to neighbouring East African countries, Tanzania’s urbanisation process is occurring faster and with a steeper incline. However, such rapid growth has raised questions on what kind of urban areas are emerging and how prepared, or adaptable, these spaces are. Migration and natural population increase are identified as the key causes of urbanisation in Tanzania. The 2012 Census showed a higher growth percentage per annum in urban areas (5%) compared to the total population (3%), with Dar es Salaam leading growth at 7% per annum. The data analysis also emphasises the importance of the growth of small towns, and migration patterns to/from small towns. Urban space in Tanzania shows limited urban planning. This report shows, the lack of planning is historical, but where found limitations emerge in how planning is conceptualised, conducted, and implemented. Urban plans are prioritised for large cities, and there is no attempt to create a national urban plan recognising, and strengthening, the connections across rural-urban space. The role of universities in developing skills for Smart Cities. A number of SHLC colleagues were able to present and contribute to a seminar held at Participatory Research in Asia (PRIA) in Delhi on 6 December 2018. The seminar, which was co-organised by the Centre for Research and Development in Adult and Lifelong Learning at the University of Glasgow in collaboration with PRIA, included a number of university and public sector partners from across India. 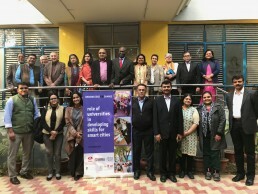 The event was held as part of the project, The role of universities in developing skills for Smart Cities, funded by the Scottish Funding Council from its contribution to the University of Glasgow’s efforts to develop activities concerned with the Global Challenges Research Fund. It followed a similar event held in Bishkek, Kyrgyzstan, on 3 December. The seminar was opened by Professor Rajesh Tandon, President of PRIA, and a member of the India Advisory Group for SHLC. Professor Michael Osborne, Co-I in the centre was a speaker, presenting both an overview of SHLC, and an international perspective on the disjunction between smart and learning cities. Research Assistants in SHLC from the National Institute of Urban Affairs in Delhi, Arvind Pandey and Baishali Lahiri were in attendance, both making excellent interventions. Given the very high profile of smart city development in India with the established of some 100 such cities in the country, the insight into these developments from this project will be valuable to the work of SHLC. More details will be made available from CR&DALL in due course. Films like ‘Slumdog Millionaire’ and ‘Favela Rising’ give us a raw glimpse of what daily life is like in fast-growing cities in the developing world. But the sprawling slums of Mumbai and the fierce favelas of Rio de Janeiro are not the only neighbourhoods to be found, and life in the slums is not the only story to be told. Rapid urbanisation and increased migration in Africa and Asia have helped drive sustainable development, and created jobs for millions who call the city their home. But fast-growing cities like Dhaka and Delhi also face growing poverty and inequality. How have neighbourhoods adapted to rapid urbanisation? What does this mean for housing, health and education? How do these neighbourhoods compare to where you live? Come and join University of Glasgow social science researchers for a photographic exhibition, as we invite you to travel to Bangladesh and beyond. See the different neighbourhoods that make up big and bustling cities in the developing world. Explore our photographs, maps and infographics. Talk to researchers, and help us understand what makes a sustainable, healthy and learning neighbourhood. This joint event, organised by SHLC and SUEUAA, will explore creative research methods. Creative methods are those that go beyond the traditional methods of focus groups, surveys, and interviews. These are methods that either utilise the natural environment, or involve arts-based activities (such as music, photography, visual or performance arts) in order to address the research questions posed. Watch recording and download presentation in the links above. This 2 hour online seminar, delivered by Dr Joanne Neary (SUEUAA) and Dr Carli Rowell (SHLC), will provide a brief introduction to the theory and practice of participatory qualitative methods. Using participatory methods in qualitative fieldwork is becoming increasingly popular, and are viewed as more inclusive than traditional qualitative methods (such as focus groups, interviews, and surveys). By using creative or arts-based approaches, it enables the research participant to take a more active role in the production of research data. Using a combination of lecture-based and participatory learning, this online seminar will cover key theories in participatory qualitative methods, explore ethical/political issues underpinning the approach, and will critically discuss the advantages and disadvantages of the application and analysis of these methods. The online seminar will cover the following methodologies: walking interviews, participatory photography and resident-drawn maps. The workshop requires no prior knowledge of participatory qualitative methods, although some knowledge of general qualitative research would be advantageous. This event is organised by SHLC and SUEUAA and funded by UKRI and the British Academy as part of the U.K. Government’s Global Challenges Research Fund. This research report reviews and analyses The Philippines’ planning and urban development policy documents for the last twenty years, identifying the key ideas and policies that have shaped the delivery of public services, paying particular attention to education and healthcare. This report also presents city profiles for two of The Philippines’ cities: Manila and Batangas. This report explores the characteristics and drivers of urbanization in the Philippines and how major policies have affected the development of the country’s major cities. It also describes how the relationship among urban development, health, education, livelihood, and migration have manifested in the Philippines. The report also describes how institutions and the policy environment have considered the concepts of social, economic, environmental sustainability in urban governance, and how the case study cities of Manila and Batangas have come to exhibit these interventions. 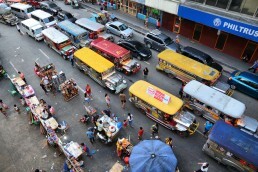 Urban planning in the Philippines is a shared responsibility of national and sub-national levels of government but local governments are considered to be the key in urban development. Urban planning follows a hybrid of top-down and bottom-up approaches. The country now espouses a decentralized approach to health care after long years of having integrated care from national down to the district level. In this arrangement, the private sector plays an active, if not, a dominant role in health services delivery. In the educational scene of present day, quality education remains as the most pressing problem. The low quality of education provided by the government has resulted to the increasing rise of private schools that are able to solve for the problems confronting public schools resulted again to a spatial and socio-economic divide when it comes to educational services delivery and outcomes. This research report reviews and analyses Bangladesh’s planning and urban development policy documents for the last twenty years, identifying the key ideas and policies that have shaped the delivery of public services, paying particular attention to education and healthcare. This report also presents city profiles for two of Bangladesh’s cities: Dhaka and Khulna. This report is written by Khulna University. Bangladesh is one of the fastest urbanising countries in the world, with an average annual rate of urbanisation of 5.34 since 1974. It is anticipated that by 2050 country’s share of urban population will reach 56%. In the face of rapid urbanisation, the number of cities in Bangladesh has increased by about 4.7 times in the last 40 years. The concentration of the urban population is rising in the large cities disproportionately compared to the rest of the cities. The urbanisation process, however, has brought some of the most pressing urban sustainability challenges. In 2011, 7.35 million people who account for 21% of the urban population live in poverty. In 2014, the number of slums increased dramatically to 13935 from 2991 in 1997. High density urban built-up areas are already putting pressure on extremely deficient urban facilities and services in the big cities. Bangladesh has made notable improvement in addressing inequality concerning school enrolment and learning outcomes. There was a dramatic rise of net enrolment rate in primary school from 90% in 2000 to 98% in 2015. The net enrolment rate at the secondary level has also increased from 45% in 2000 to around 54% in 2015. Still, urban exclusion, gender inequity and spatial imbalance of service distribution are challenging the effective and inclusive education service provision. Urbanisation process in Bangladesh has witnessed an improved health status of the urban people. The country has also achieved notable recognition in improving general health status in compare to many of its neighboring countries in South Asia, in terms of reduced maternal mortality, reduced under-5 mortality, reduced infant mortality rate. Still, per capita expenditure on health sector is only about 5 USD against the standard of 34 USD. Both the health sector and education delivery system are highly centralized system, which often leads towards inefficiency and inequality of service provision. Both Dhaka and Khulna are finding it difficult to provide urban services and quality built environment to their citizens. 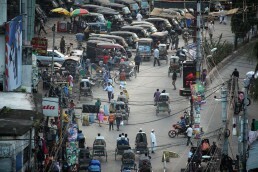 Dhaka’s challenge are linked to its inability to meet the demands of its growing population. However, Khulna is struggling because of limited investment and resources. Both the cities have local level urban plans in place but Dhaka has a more forward-looking plan that includes sustainability agendas. There are policy implementation challenges for both Dhaka and Khulna, which are mainly because of uncoordinated development projects and a lack of institutional and funding strength of the local planning and City Corporations in the cities. This research report reviews and analyses India’s planning and urban development policy documents for the last twenty years, identifying the key ideas and policies that have shaped the delivery of public services, paying particular attention to education and healthcare. This report also presents city profiles for two of India’s cities: Delhi and Madurai. This report is written by the National Institute of Urban Affairs. India, one of the fastest growing economies of the world, has witnessed a deceleration in the growth of population during the last three decades, dismissing the spectre of over-urbanisation. Urbanisation in India is increasingly becoming exclusionary in nature. The past two decades have witnessed a systematic decline in the share of rural to urban migration in India’s cities. Public spending on health is still very low. Although this is not the case for education sector, both sectors suffer from a lack of holistic and integrated approach to ensure an efficient and effective system of delivery. Further, there has been an increasing dependency on the private sector in both cases. This can be attributed to the lack of adequate and quality services in the public sector which has adversely impacted the urban poor. A holistic and integrated development approach and coordination among different stakeholders is essential for Delhi and Madurai to meet the Sustainable Development Goals and become a model of learning and healthy cities in India. This research report reviews and analyses Rwanda’s planning and urban development policy documents for the last twenty years, identifying the key ideas and policies that have shaped the delivery of public services, paying particular attention to education and healthcare. This report also presents city profiles for two of Rwanda’s cities: Kigali and Huye. Rwanda is one of the most densely populated countries in Africa, with 394 persons per km2 in 2008 . Rwanda is labelled ‘the land of a thousand hills’ due to the hilly topography. This means that although land is a prime resource, much of it is too steep or too wet to build on. Rwandan land tenure has been mainly conditioned by three factors: the natural environment, population, and politics. Twenty-four years after the genocide against the Tutsi, the Government of Rwanda (GoR) has clearly embraced urbanisation, seen as a vehicle for post war reconstruction in Rwanda. Indeed, the urban development agenda is seen as a possible resource to unlock the transformative economic opportunities for growth and poverty reduction through which Rwanda could make significant progress in its national development. 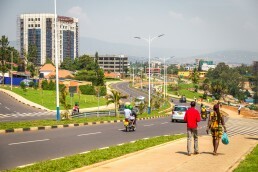 Rwanda is urbanising rapidly as well as proactively planning for it. Urbanisation in Rwanda is catalysed by demographic growth, migration to urban areas and installation of returnees after the 1994 genocide against the Tutsi. The urban population was 4.6% in 1978, increasing to 16.5% in 2012 and is expected to reach 35% by 2020. The average urban density is 1871 inhabitants per square kilometer. The current annual growth rate of the urban population is 4.1%. Almost 80% of the city’s residents live in unplanned settlements. The capital city, Kigali, accommodated about half of the urban population in 2012. Since 2000, steps have been taken towards restructuring and decentralizing healthcare. Now the district health offices operate as autonomous entities, providing services to well-defined populations in either urban or rural zones. Despite many achievements recorded in education, there are still challenges that must be tackled to halt the threats to the education system. Challenges include insufficiency of school infrastructures, namely classrooms, and textbooks in various schools to meet the student’s demands.